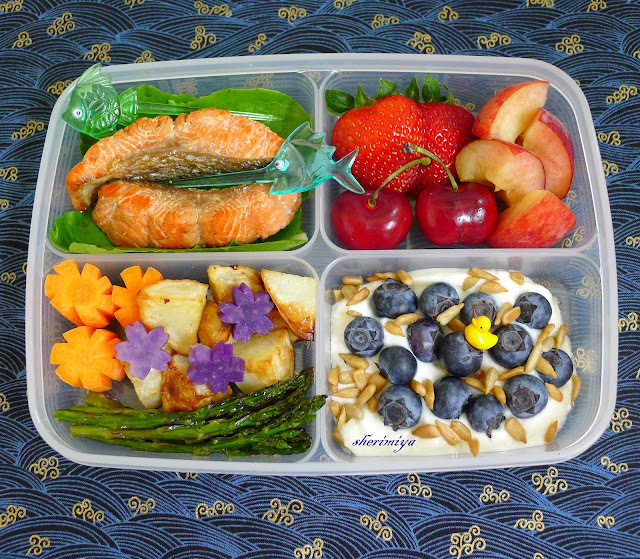 Salmon Asparagus and Potatoes Bento, a photo by sherimiya ♥ on Flickr. Wow, it's been so long since my last bento post! Seems like we've been on summer vacation forever! Luckily, it's only the 2nd day of actual summer so far, and I for one am really looking forward to the next 2 months of fun and freedom! We've been out of school since the first of the month, so there haven't been any new bento since then. I'm showing you the last few bento I made during the last week of school, when it was just too busy to post and blog. They should look very familiar, and I've come to rely on salmon/asparagus/potatoes as one of my standard fall-back bento. Happily, the kids love salmon, which I prepare in a few different ways to change it up (butteryaki, furikake, cajun, miso, dijon). Misterman's version comes in the EcoLunchbox while TinySprite's is packed in the cute 4-sectioned plasticware box. There's also yogurt with fruity toppings in there too. Hope you all are enjoying the best season of the year! I look forward to seeing what you've been cooking up! Any new gluten free successes? Lots of interesting experimentation going on over here, in fact, Kristie! So excited to share with you, and see what you think too. I'm trying different binders and flours, and learning a lot about each kind. Uploading on the way! so pretty! may I ask what is the purple flowers made of? Thanks Shirley; those are steamed Okinawan sweet potato. And YES! I am totally with you about taking the blog in the most relaxing way (ha! Look at my blog, dust all over ;)... but I am so excited about your baking adventures! hmmmhhh looks delicious !!!! I love salmon !! salmon/asparagus/potatoes as one of your standard fall-back bento, that sounds nice :D Such a good combination, i should try one day ! I don't know why but i always cook salmon with rice... Never thought of potato !! 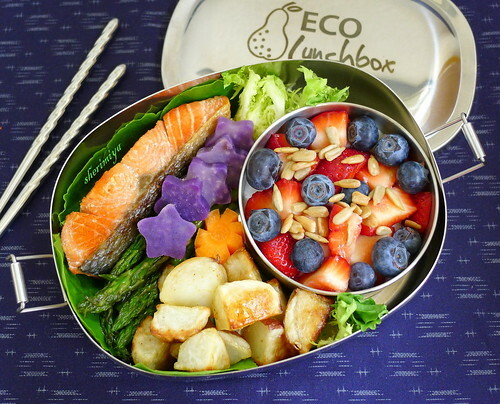 This looks appealing and gives good colour to the bento !! :) And your photos from the top are absolutely beautiful, again... I never managed to take good photos from the top, i wonder how to do ! I should take example, hahah ! I love salmon with rice too! My favorite bento is shiozake on rice. SO good. This kind of salmon is more appealing to kids so I make it this way, plus it's good with all kinds of veggies on the side. Asparagus, brussels sprouts, kabocha, whatever.